Aren't these cupcakes adorable?! I saw Martha Stewart do a cutout heart cupcake for Valentine's Day, and I decided to make a St. Patrick's Day version. The cupcakes were extremely festive and a lot of fun to eat! These couldn't be easier. Just bake the cupcakes, slice off the tops, frost the stumps, cut out a shamrock shape in the tops and reassemble. I used the shamrock cutter that came in my Pampered Chef Creative Cutters set and it was the perfect size (about 1-inch). I used a boxed cake mix and a can of pre made frosting, but feel free to use your favorite homemade cake and frosting recipe. These would be great for a St. Patrick's Day party. Make cupcakes according to directions on the box. Cool completely. Mix green food coloring into the can of frosting and mix well. Use as much green food coloring to get the desired shade of green. Using a serrated knife, cut the tops off chocolate cupcakes. 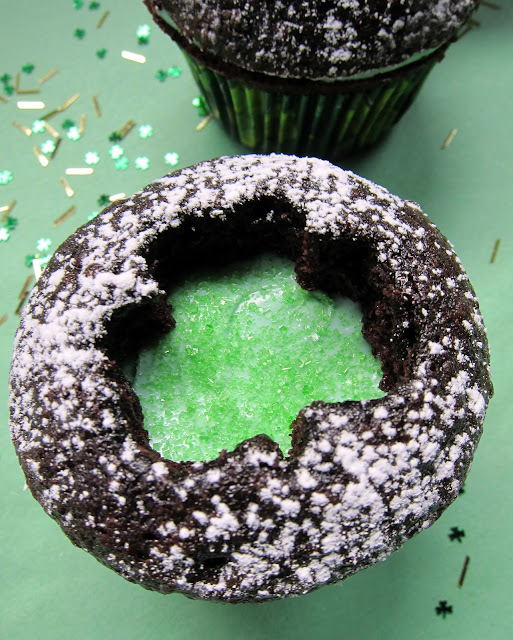 Frost the cupcake stumps with green frosting and sprinkle with green sugar. Using a shamrock cookie cutter, cut a shamrock shape out of the cupcake tops. Sprinkle cupcake tops with powdered sugar, if desired. Place the cupcake tops back onto the cupcake stumps. Ya'll are going to have a great St. Patty's day. We will be horse showing.